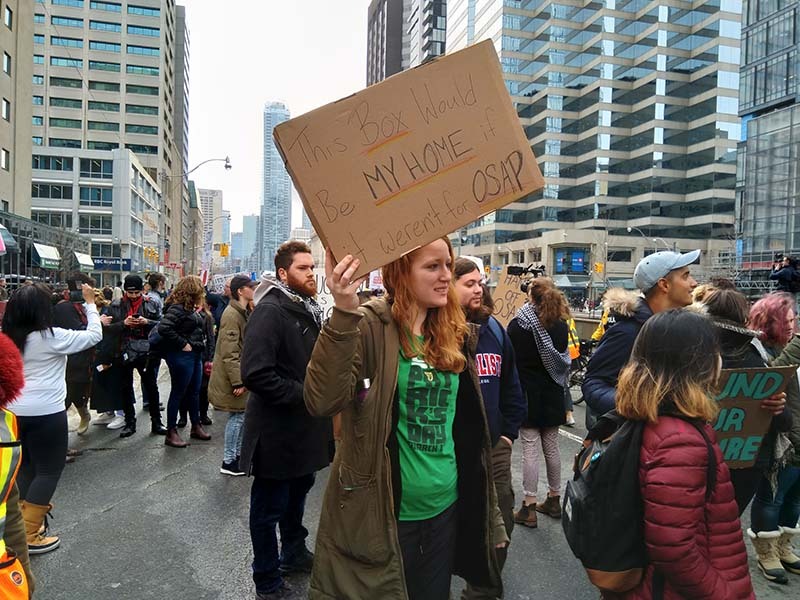 TORONTO – A dozen students from Loyalist College joined hundreds of other students in a protest march in Toronto on Monday over the provincial government’s new policy changes to OSAP. 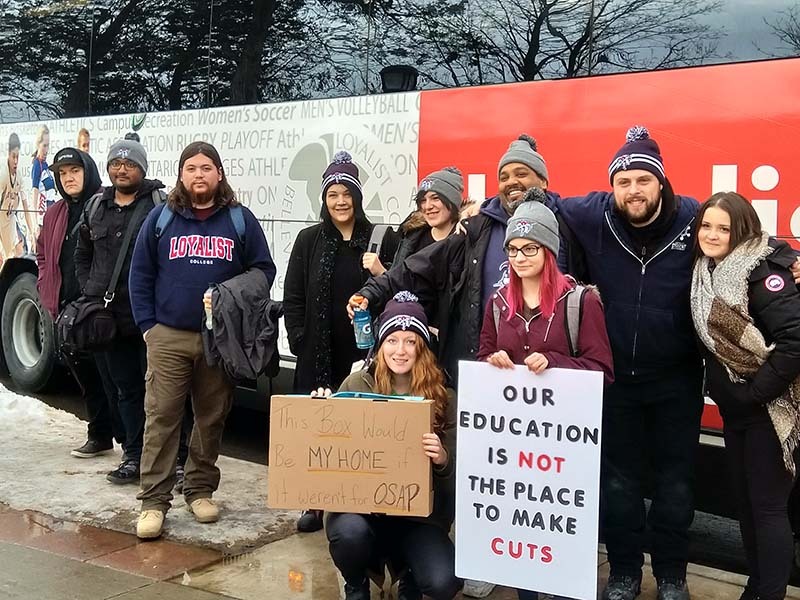 The students left the college in the morning to Toronto on a free bus provided by Loyalist Student Government. Tayla Genereux, a culinary student, was one of those who went on the bus. 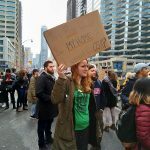 “I had plans to go to the protest in Kingston and then the school posted on the Loyalist Facebook page that they were providing a free drive, so that was my big opportunity to come out to Toronto and be part of an even bigger protest,” she said. 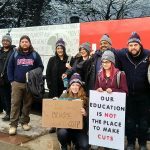 The bus arrived at the corner of University Avenue and Armoury Street where the march began. The group disembarked and joined the march starting at noon, which ended at Queen’s Park. 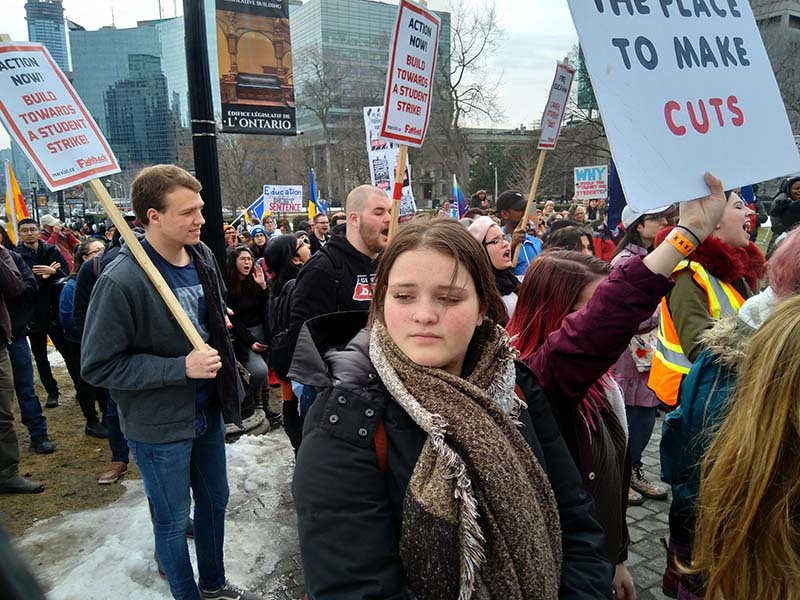 Many in the crowd were holding different signs with slogans like “Our education is not the place to make cuts,” and “Cut Ford not OSAP.” Still, others chanted and banged drums loudly. Once the marchers arrived at Queen’s Park, they converged on a small stage set up just outside the Ontario Legislature. 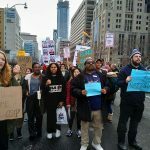 Protest organizers, students, and members of the Ontario Liberal and NDP parties gave speeches on the stage. The speeches covered how students will be affected by the changes, their personal stories and what students are doing to fight these changes. When the speeches ended at 1:30 p.m., most of the students dispersed even though the protest was supposed to end at 3 p.m. The Ontario Government has changed how the Ontario Student Assistance Program is structured, increasing the number of loans and removing free tuition for any students whose families make more than $14o,000 a year. No student will receive grants alone, with students whose families make less than $50,000 receiving 83 per-cent of the grants. The previous grace period of six months before loans started acquiring interest is also removed. 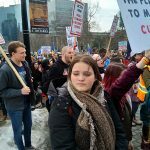 The provincial government is also decreasing tuition by 10 per-cent and allowing opt-out of ancillary fees, fees that pay for non-essential services such as student governments and support services. 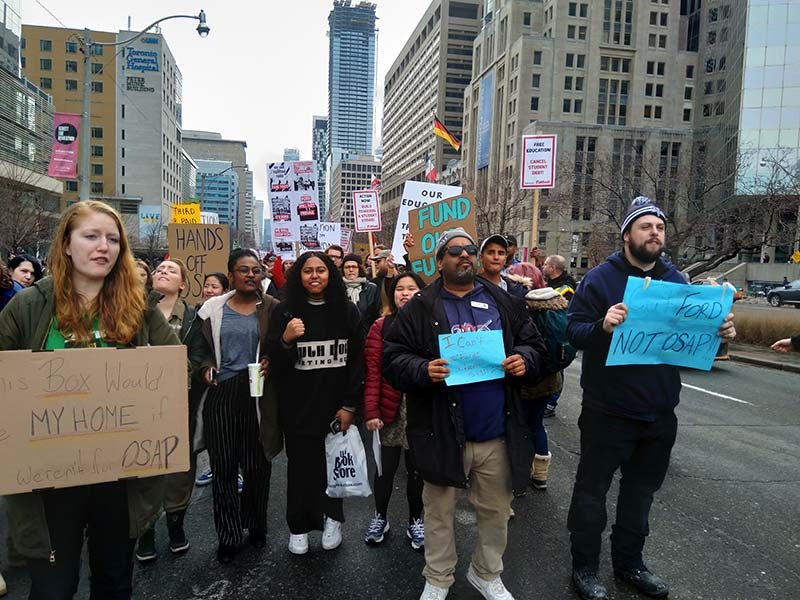 The Loyalist students were very passionate about OSAP during the march. Calhoun said she receives just enough money to support herself and is worried that the new policy may put her at risk. “We don’t get a lot, you know, we just get enough to get by. We can’t spare any,” she said. Genereux was also worried about the future because of the policy changes, specifically the removal of the six-month grace period. “Now I am going to have to pay back $15,000 in loans. That’s become a much bigger issue now because I won’t have six months to get a job. It’s immediate,” she said.